Heather Nauert, does she have what it takes? Former "Fox & Friends" host and current State Department deputy Heather Nauert, according to several media outlets, has reportedly been offered the job as U.S. ambassador to the United Nations. 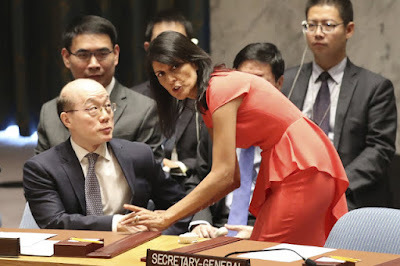 She has little in the way of seasoned diplomatic experience and will never join Ralph Raico in the great historians' department. In July 2018, she cited the 1944 D-Day invasion of Nazi-occupied France and linked it with a strong relationship between the United States and Germany. It's possible she was attempting to get across the point that the U.S.-German relationship has come a long way since D-Day but it is still bonkers to bring up when discussing the current U.S. relationship with Germany. That said, I have canceled my planned viewing of "McHale's Navy" reruns this winter to make sure that I have plenty of time to follow "Nauert Becomes an Ambassador." But, hey, the neocons should love her. In April 2018, she voiced support for Saudi Arabian-led intervention in Yemen. In May 2018, Nauert said in response to the Gaza border protests: "We oppose actions against Israel at the International Criminal Court (...) because it does not help the cause for peace." But I wonder from Trump's perspective if he sees much difference between current U.S. ambassador to the United Nations Nikki Haley and Nauert. He might even consider it a staff upgrade. It may come down to what Trump considers the primary role of the U.S. ambassador to the United Nations. President Trump denied offering State Department spokeswoman Heather Nauert the role of U.S. ambassador to the United Nations, saying Thursday he remains undecided on who he will nominate to replace Nikki Haley. Earlier in the day, several news organizations reported that Trump either was expected to nominate Nauert, had offered Nauert the job, or told Nauert he intended to nominate her. Fox News, ABC News, and the Wall Street Journal all cited an administration official. I was going to say that from the picture above, I'd say she's definitely qualified.